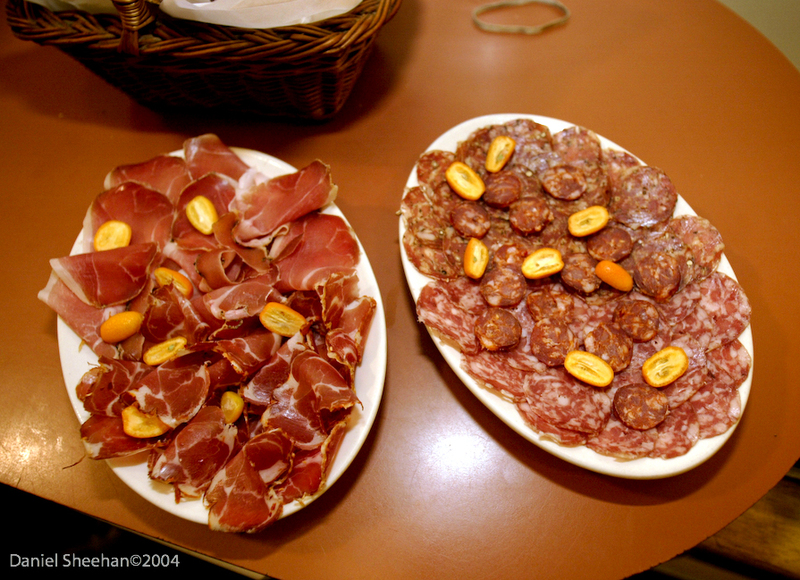 A couple of plates of salumi some prosciutto and salami on the right. 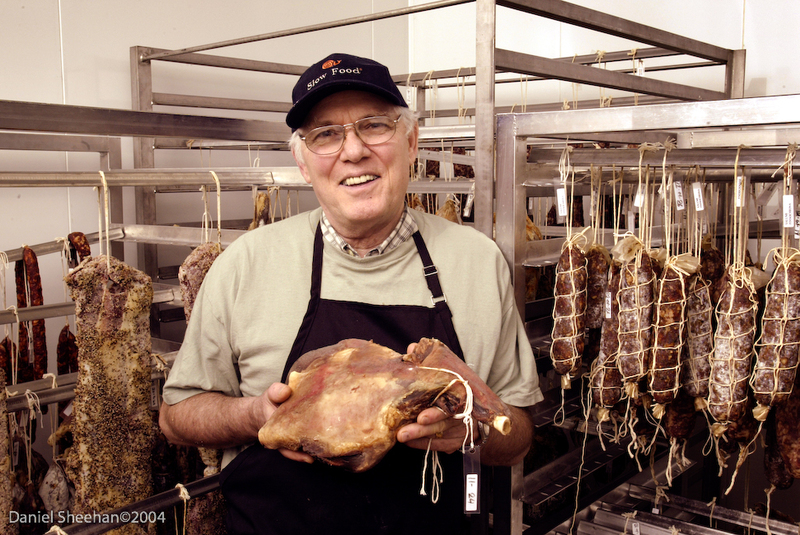 In keeping with the Salumi Artisan Cured Meats family plan, (that of advancing the art of meat curing to some new directions whilst maintaining the traditions of the past), we some time ago decided to develop a cured lamb product — albeit we loved the flavor of lamb – barbequed, grilled, roasted, burgers, shanks, leg, shoulder, tongue, sweetbreads. Perhaps our love goes back to our childhood – when we were only able to get lamb infrequently and thus it was saved for very special occasions or perhaps our love was nourished while living in Europe where lamb is so much more a highly respected food, or perhaps even while picnicking in Spain with the locals in some field on a grand and glorious day grilling lamb chuletas over an open fire of olive branches. Whatever it is/was we loved lamb and the whole family shared that love. 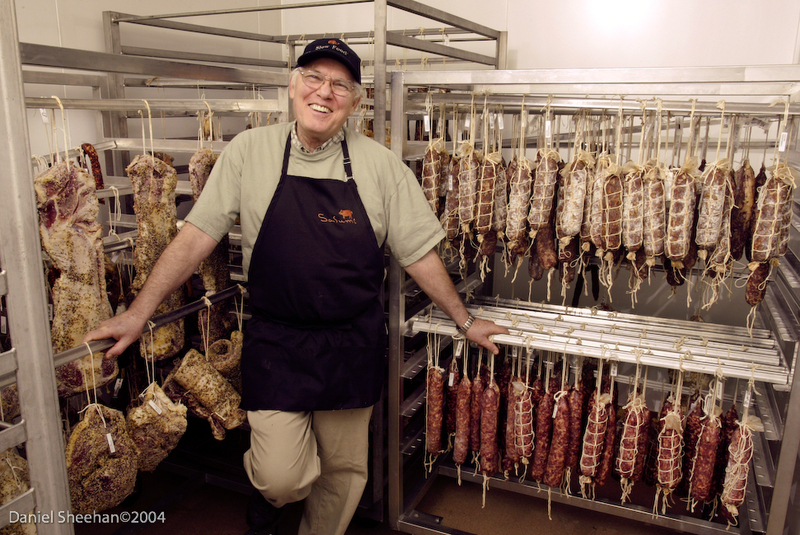 Anyway when we started dry curing products, I often asked why there were so few dry cured lamb products. Even in history there are few and those there are so limited. When one reads SALT (a great book studying the history and culture of Salt), the Scandinavians continue today with maybe two or three, or in Greek History you may read about one or two, same with the Icelanders. Even in the Middle East where salt was so prevalent for so many years for preserving foods and even bodies, very few lamb products were created that came down the time of history to become traditional or available as dry cured products. Even more so here in the United States. Certainly we are aware of the history of lamb and its back burner status in American Ranching, from western movies if not anywhere else. Photograph by Seattle Photographer Daniel Sheehan specializing in photojournalism, portraits and photography for publications and corporations, and Seattle wedding photographers, with a candid photojournalist style. 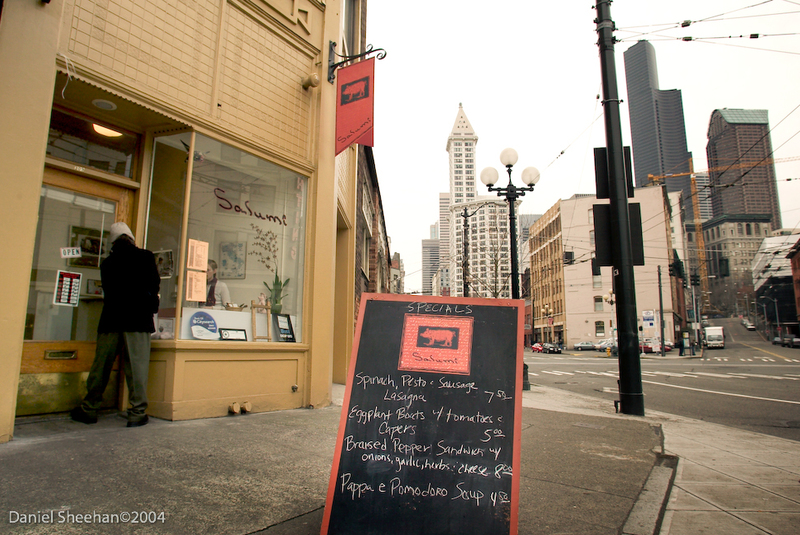 This entry was posted on Wednesday, April 7th, 2010 at 10:51 am	and is filed under CORPORATE, EDITORIAL, FOOD and tagged with FOOD PHOTOGRAPHY, restaurants, Seattle Photographer. You can follow any responses to this entry through the RSS 2.0 feed.